Flyte Systems tapped its parent company, Industrial Television Services (ITS), for an expanded product line of digital signage solutions for hospitality and related businesses. At HITEC in New Orleans, June 20 – 23, Flyte Systems will showcase a family of advanced display services that go beyond hotel flight information to smooth the travel experience. 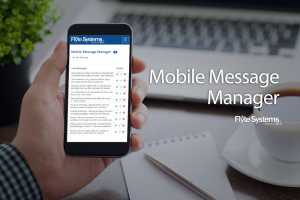 Topping Flyte Systems’ innovation list is the Mobile Message Manager, which lets authorized staff update digital signage guest messaging anywhere, anytime from any mobile device. “Flyte Systems is coming to HITEC 2016 with a new lineup of digital signage services and systems,” said Vice President Scott Triphahn. “We deliver much more than airline information today. We drew on our parent company ITS to create display solutions that meet the information needs of virtually any hotel or related business.” The first innovation is Mobile Message Manager. This enables hotel operators to instantly change and create digital signage messaging remotely and in real time from a handheld device so meeting information, wayfinding, and events are always current. Managers can provide guests with the most up to date information without having to divert staff from guest facing duty. Applications include informing guests of last minute promotions and specials, shuttle schedules, welcome messages, and weather and travel related events to name a few. Other new digital signage solutions from Flyte Systems include enhancements to InfoBoard and Hotel EventDisplay. EventDisplay is a reader board of property events that can include property maps and touch screen wayfinding to get conference attendees to their venue faster. EventDisplay can also include individual meeting room signage outside each room, providing confirmation to attendees that they have reached their correct destination. EventDisplay is simple, fast and easy to update centrally. “We will implement EventDisplay displays and room signage as a standalone installation or integrated with our InfoBoard display,” said Triphahn. Hotels and other business use InfoBoard as a digital concierge for wayfinding, property event information, local area attractions, flight information, and boarding pass printing. “InfoBoard is a digital touchscreen virtual concierge that provides guests with options for area event searches, property outlet menu options, a dining directory, as well as EventDisplay functionality,” Triphahn said. Businesses use InfoBoard to combine a building directory with property and local area attractions for visiting business people. InfoBoard’s property-customizable format is available in multiple installation options that include wall mounted or freestanding enclosures for greater flexibility to match a variety of lobby design formats. “Flyte Systems continues to smooth the travel experience, but now does it with many more tools to keep travelers on time and in the right place,” Triphahn said.